Perhaps you have asked yourself the question: are trampolines a good workout? As far as the mini trampoline for adults, the verdict is still out on what that might be. 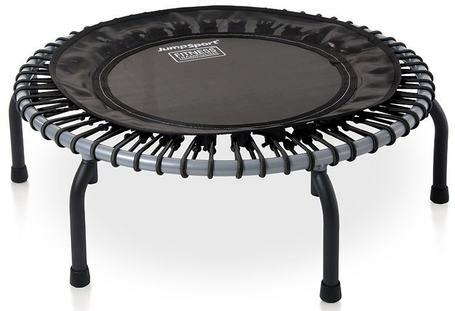 There are, indeed, many benefits of using a rebounder mini trampoline, including the draining of lymph nodes, decreased joint pressure that runners typically experience through their exercise, and the ability to lose weight while exercising at one's home There are also a number of exercises that you can do on a mini trampoline such as the JumpSport Model 250 Fitness Trampoline..
You can find these exercises on YouTube or other shared media channels if you are curious about them, and, in fact, the trampoline even comes with an exercise DVD. 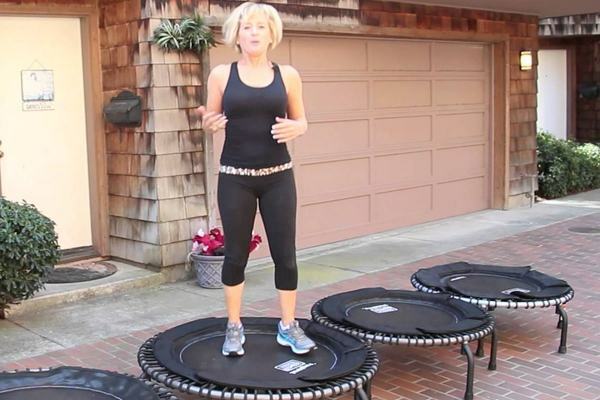 And, of course, there is the typical rebounding jump that you can do repetitively to help you lose those extra pounds or just feel better. This trampoline can hold up to 250 pounds, so it is ideal for larger people wanting to lose extra weight. The trampoline is almost fully assembled when it arrives at your doorstep. 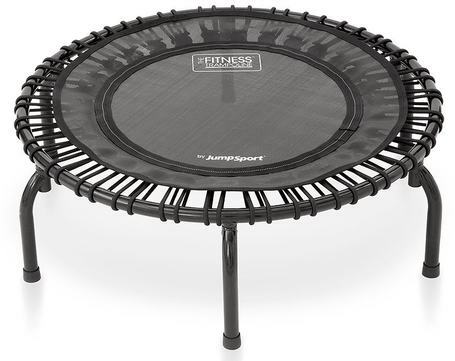 For the JumpSport Model 250 Fitness Trampoline, the frame and legs have a lifetime warranty, and the mat and cords are under manufacturer's warranty for two years. In terms of pros, this trampoline actually gets high marks because it does not break after a short time of use, and is in fact easy to use a lot while still functioning well. 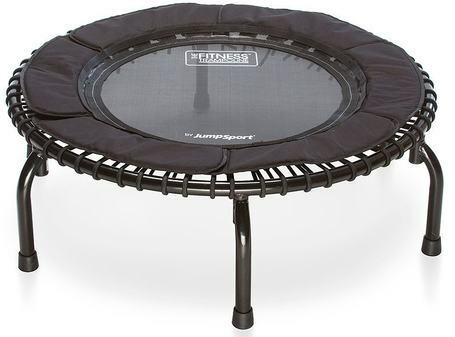 In order to avoid broken springs on a trampoline, the JumpSport Model 250 Fitness Trampoline uses bungie cords instead of springs in order to keep any accidents far from home. It's also very easy to replace the bungie cords when they break, and you won't find that you're unable to do it by yourself. This is an extra level of quality that is definitely worth paying for, and it gives the trampoline a gym-like quality that takes it to the next level. You can, if you need it, purchase a bar to hold on to while running or using the trampoline. This makes it ideal for older users, and it is also easier on the joints because of the bungie cords that it uses. And, most importantly, this trampoline is quiet. The metal springs on a trampoline would definitely cause it to make more noise, and the bungie cords keep this one quiet. The JumpSport Model 250 Fitness Trampoline is steadily built, and it also comes with a DVD of exercises, so you can get right to work with this. This trampoline doesn't have as many cons as some of the others might. You may receive it with two pieces of critical hardware missing, and this could keep you from setting it up right away. Another thing that may happen is that the straps could come unraveled. This could happen as early as three months into your owning the trampoline. If all the straps come unraveled, then you're certainly unable to use the trampoline at all. Also, another thing that could happen is the cords could break, and the stitching could come apart. So, clearly, this trampoline is not flawless. Even if you are not overusing it, and are not overweight, this trampoline could begin to fall apart and not function properly. Also, if the parts do wear out, keep in mind that it's under warranty. However, even though it is under warranty, you will still have to pay for shipping to get your new parts to you, no matter what size the part is. This could run up the cost of the trampoline by as much as $100 in the first year after you buy it. So, one thing to keep in mind is that if you are a heavy bouncer, you may want to get a different model. Also, you may want to know that the legs may fall off. The trampoline is not flawless, and so keep in mind that it could end up costing you extra in shipping, even though there is a warranty that is substantial for a piece of equipment of this type. In conclusion, any trampoline purchase is a risky one if you're not used to using one. So, make sure, if you buy this JumpSport Model 250 Fitness Trampoline, that you find out how to use it beforehand and follow instructions. That said, it's up to you how you take the positive and negative information presented and use it to decide about your trampoline. While the bungie cords make this trampoline a good choice over metal springs, clearly the bungie cords can come unraveled, and you can't always know what's going to happen with your particular trampoline.